The $1,000 Envy 13 gives you a lot more than the $999 Surface Laptop. HP's latest Envy 13 debuts in a post-Surface-Laptop world, where PC makers seem ready to challenge the MacBook Air's dominance in the thin-and-light category. Due to ship in June or July, the Envy 13 may lack the exotic touch of the Surface Laptop's Alcantara-clad body. Based on the specs, however, it could offer greater value. The Envy also comes with full Windows Home rather than the Surface Laptop's Windows 10 S.
We're comparing the main specs of the Envy 13's middle SKU, priced at $1,000, to the Surface Laptop's base configuration at $999. The Envy will have two other SKUs for $890 and $1,180, with more customizability available via hp.com. What this means for you: It's a good time to be shopping for a laptop. HP's Envy 13 is the first of what could be many MacBook-Air-killing models, following the Surface Laptop's lead but likely offering greater value. We expect even more laptop choices in the near future, as AMD's Ryzen Mobile CPUs enter the picture. 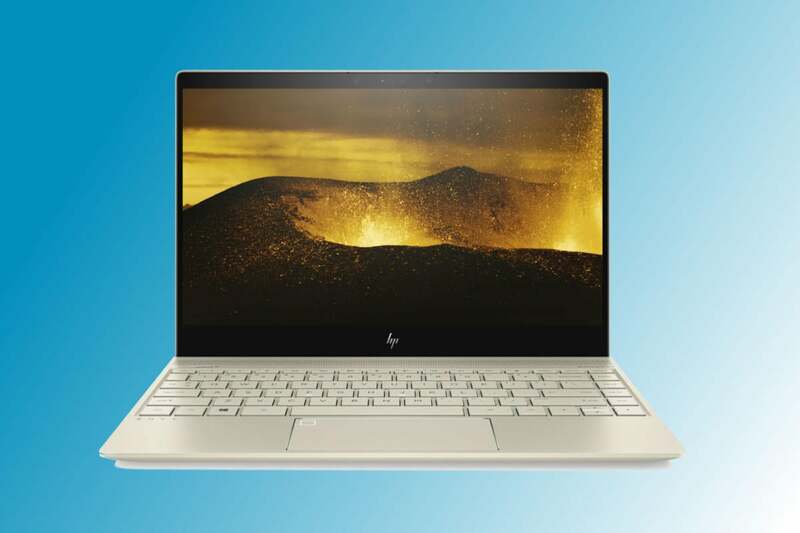 Starting with the basics, the HP Envy 13 will have an Intel Core i5-7200U CPU, from the company's current 7th-generation Kaby Lake line, supplied with 8GB of RAM and a 256GB SSD. The 13.3-inch touch display has a Full HD resolution (1920x1080) and Intel HD 620 integrated graphics. An N-trig-based stylus is included. The same-priced Surface Laptop falls short. It will have a Core i5 CPU (we don't know the specific part number yet) with just 4GB of RAM and a 128GB SSD. Integrated Intel HD 620 graphics powers the touch display, which is 13.5-inches diagonal and has a much higher resolution of 2256x1504 pixels. The Surface Pen is an extra-cost item. The Surface Laptop that matches the Envy 13 in these specs costs $1,299 (and still doesn't include the pen). Discrete graphics option: Although it's not included on the $1,000 unit we're comparing, the Envy 13 product line will have a discrete graphics option available. The base Surface Laptop will have only Intel HD 620, while a pricier SKU will get Intel's higher-end Iris graphics. The ports: The Surface Laptop has a surprisingly skimpy port selection: just one USB 3.0 Type A port and a mini-DisplayPort. The Envy 13 leaps ahead here, offering two USB 3.1 Gen 1 Type A ports, plus two USB 3.1 Gen 1 Type C ports, which can handle data (5Gbps) and DisplayPort 1.2, plus charging. Dimensions and weight: The HP Envy 13 offers this generous port selection in a slightly smaller package: 12.04 x 8.49 x 0.55 inches, compared to the Surface Laptop's 12.13 x 8.79 x 0.57 inches. Weights are 2.72 and 2.76 pounds, respectively. And of course, Windows: The HP Envy 13 comes with Windows 10 Home. The Surface Laptop will ship with Windows 10 S, the constrained version of Windows 10 designed for classroom management. While students may be required to stick with Windows 10 S, other users have the option of upgrading from that to Windows 10 Pro. While some specs are purely factual and easy to compare, a few claims can't be proven until we test them. Battery life's the big one. HP claims up to 14 hours and 15 minutes in "mixed usage," which was not defined more precisely. In contrast, the company claims up to 12 hours and 30 minutes in "video playback," which it defines very specifically as continuous video playback of a locally stored 1080p video file, with the system set to 150 nits' brightness; system audio set to 50 percent, and playback audio set to 100 percent with headphone attached; and Wi-Fi and auto-dimming disabled. Microsoft claims the Surface Laptop will last up to 14.5 hours in continuous video playback, though without further information as to how it arrived at that number. User experience is the other unpredictable element. The Envy 13's brushed-finish aluminum and magnesium chassis promises to be both strong and light, but it lacks the head-turning uniqueness of the Surface Laptop's Alcantara-clad body. There's also a subtle difference in the laptops' keyboards: The Envy 13's has 1.3mm of travel, while the Surface Laptop's has 1.5mm. That doesn't seem like a lot, but Microsoft is known for the quality of its laptop keyboards, so HP has something to prove there. We'll be sure to look into all of this more closely if we get an Envy 13 unit to review.